Indonesia has 7 of the 19 types of gibbons in the world. 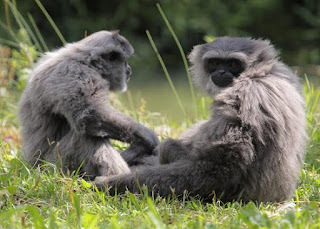 Javan Gibbon (Hylobates moloch) is one of them and endemic in Java. Javan gibbon is very important in the sustainability of forest ecosystems. This is because it helps the spread of seeds which will later grow into trees. They are monogamous or have only one life partner throughout their lives. Javanese gibbons live family in their territory. Most Javanese baby gibbons are the target of hunting for pets. However, to get a baby gibbon, it is not uncommon for the mother to be killed. The IUCN Red List determines the status of this species endangered. According to researchers the number in the wild is only around 2,000-4,000 individuals. The Indonesian government based on Law No. 5 of 1990 concerning Conservation of Biological Natural Resources and Ecosystems determines Javan gibbon as a protected species.